Michael Mixtacki is a percussionist, vocalist and educator based out of San Antonio, TX. He is currently on faculty at the University of Texas at San Antonio, teaching percussion and drum set lessons and co-directs the UTSA Percussion Ensemble. He is the director of the UTSA Summer Percussion Camp and is an active clinician and private instructor at several middle and high schools in San Antonio. Since moving to Texas, Michael has also enjoyed performing with a wide variety of ensembles including the San Antonio Symphony, Mid-Texas Symphony, the UTSA Faculty Jazz Quintet, the South Texas Jazz Quartet, and the Katchie Cartwright Brazilian Jazz Trio to name a few. Prior to his appointment at UTSA, Michael taught at Northern Illinois University in DeKalb, IL. While living in the Midwest, Michael performed with a variety of different groups, including Ire Elese Abure in Chicago, IL, Ritmos Unidos in Bloomington, IN, and Grupo Balança and the Madison Symphony Orchestra in Madison, WI. He had the honor of participating on two Grammy nominated recordings with Wayne Wallace and Michael Spiro, and recorded on drum set, lead vocals and percussion on two albums with Ritmos Unidos. 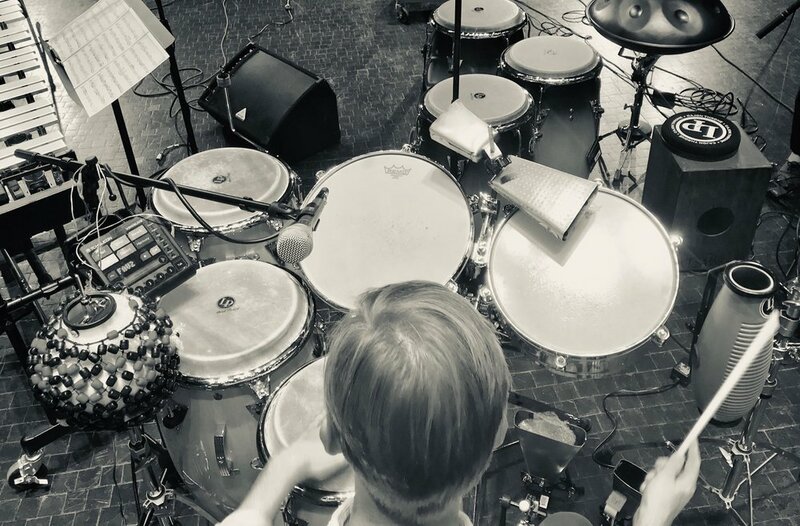 Michael has been a guest artist at many colleges, high schools and summer workshops across the country, and has participated in numerous clinics and performances at the Percussive Arts Society International Convention and the Jazz Education Network Convention. Michael earned a Bachelors degree from the University of Wisconsin-Madison and a Masters degree from the Indiana University Jacobs School of Music. He is an official clinician for the Latin Percussion Department of Education and is a Yamaha Performing artist. Michael also endorses Sabian cymbals, Remo drumheads, and Innovative Percussion sticks and mallets. Duo Milando is my latest project with marimbist and Latin percussionist, Orlando Cotto. I got invited to play at my friend Evan Chapman’s wedding in Maryland, and realized it was down the street from Orlando’s house. He and I first got the chance to play together at the Birch Creek Percussion and Steel Band Session in Egg Harbor, WI. In 2010, he invited me to join him on his showcase performance at the Percussive Arts Society International Convention in Indianapolis, IN. We formed Duo Milando in Fall 2017, and performed our first showcase concert together at the UTSA Recital Hall in November, 2018. Here’s a video we made from Orlando’s visit to San Antonio - Miguel Matamoros’ “Son De La Loma,” arranged for marimba, percussion and vocals - ¡a gozar!